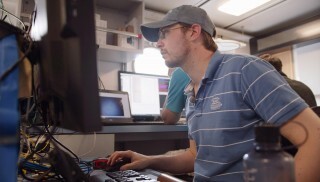 Scientists aboard Schmidt Ocean Institute’s research vessel Falkor have developed the first 3D model of an entire hydrothermal vent field for Virtual Reality, covering the largest area of seafloor ever imaged that way. SUVA, FIJI – After 13 days at sea, chief scientist Dr. Tom Kwasnitschka from GEOMAR Helmholtz Centre for Ocean Research Kiel, along with other members of the team, will depart research vessel Falkor making history. Over 48 hours of underwater robotic diving with ROV ROPOS allowed the science team to study a rarely visited hydrothermal vent field at the Niua volcano in the Northern Lau Basin. Using newly constructed imaging equipment, the science team was able to reconstruct the vent site in 3D using virtual reality technology. This will allow scientists all over the world to study this unknown environment without having to leave their labs. The scientists mapped the entire vent region and captured 4K video sequences for immersive hemispherical or virtual reality display in real time. The primary goal of this study was to create a series of 1-cm resolution 3D models of vent groups that can be used as an environmental map at unprecedented resolution. Simultaneously, the team was also able to characterize the geological, biological and hydrochemical features of the Niua site. To better protect deep-sea hydrothermal systems, new survey technologies are needed that will allow quantifiable and high-resolution monitoring for investigations of these remote environments. 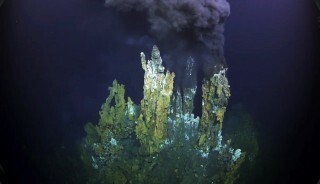 Huge changes for the ecosystems and geography of seafloor hydrothermal vent systems could be in the very near future. However, if these areas are not explored, investigated, and recorded before change arrives, then we may never know what was there. By using the cutting-edge 3D survey tools, the “Virtual Vents” team has opened this remote environment to the public in a way that has never before been possible. This innovative research approach has sparked a new strategy for ocean floor research and created an immersive tool for public engagement. 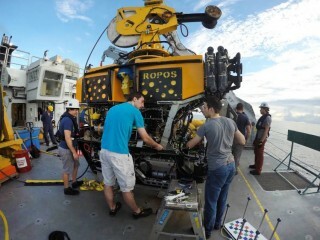 The team shared this experience with the public in real time, making all ROV dives publicly available, and drawing in over 16,000 viewers from 95 countries. Schmidt Ocean Institute will be heading to the northeastern Lau basin in just a few weeks with chief scientist Dr. Charles Fisher and his team to further examine the biological activity of similar extreme yet delicate deep-sea ecosystems. Click here for more information about the expedition; pictures and b-roll available of R/V Falkor and the virtual vents cruise. High resolution 3-D video of the vent available here (change to 4K on You Tube).